Circa-1720 Queen Anne lady doll, England, 25 inches tall, gessoed and painted carved-wood head, wood torso with mortise and tenon jointed wood arms and legs. Presented in mahogany and walnut veneered display case. Estimate $50,000-$70,000. Image courtesy Skinner Inc. 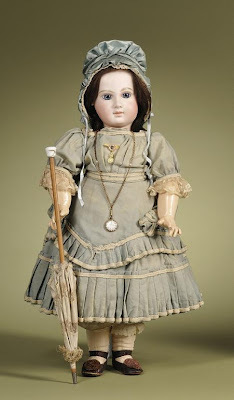 Portrait Jumeau bebe, so called 'Elizabeth' doll, circa-1880, France, 23 inches, pressed-bisque socket head, fully jointed composition body marked Jumeau, Au Nain Blue store label, original signed E. Jumeau brown leather shoes. Estimate $10,000-12,000. 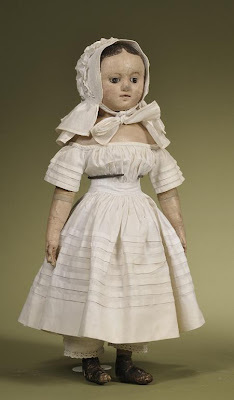 Image courtesy Skinner Inc.
Izannah Walker oil-painted on stockinette cloth doll, Rhode Island, circa 1860, 18 inches. Estimate $15,000-18,000. 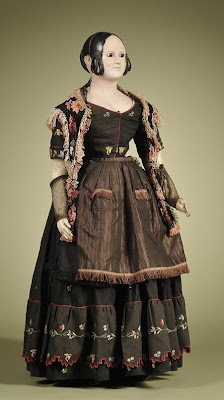 Image courtesy Skinner Inc.
Circa-1840 German papier-mache lady doll, 33 inches, provenance: Estate of Maurine S. Popp. Estimate $10,000-$15,000. Image courtesy Skinner Inc. I love the adult dolls. Great dresses! And the big sizes of those dolls. I like the big dolls. Tendré que poner fotos mias desnudo en mi blog para superarte!